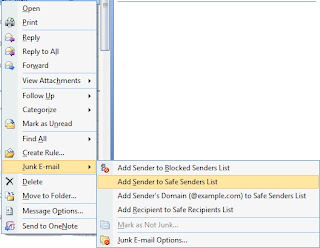 Have you ever received a legitimate e-mail in your junk folder before? 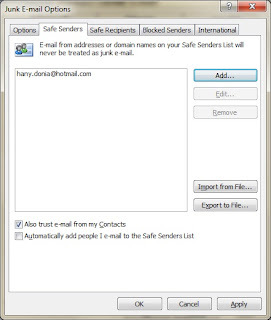 You can trust recipients you are mailing to by checking the “Automatically add people I e-mail to the Safe Sender List” check box. 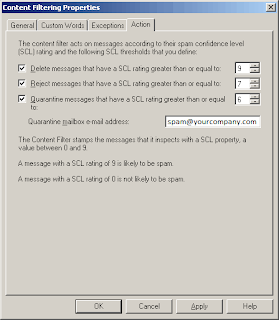 Note: This data is stored in your mailbox with the limit of 3,072 unique entries in Microsoft Exchange Server 2007 Service Pack 1. So is there any magical way to allow my content filter agent to see my safe sender list so it won’t process mail from that list and I’ll have all my legitimate mails? How to update my whole environment safe list? at 22:00 /every: F cmd /c "D:\SafeList.bat"
How to verify that Update-Safelist is working fine? Don’t run the Update-Safelist command during your working hours unless you will run it to very limited number of users.